Inspired by this question, this question and this question, I, too have been thinking about typical RPG-style magic systems. It's a truism in RPGs (and fantasy in general) that armour and magic don't mix (fair warning: that's a TVTropes link) - that is, wizards are capable of astonishing feats of magic as long as they wear nothing more protective than robes and a pointy hat. This is, of course, done for reasons of balance, and often handwaved away by saying that the armour is restrictive and prevents the wizards from performing the complex gestures (also a TVTropes link) necessary to cast spells. Speaking as someone who owns a haubergeon, this blanket ban on armour (for this reason) seems at best suspect, especially given the existence of cleric-type characters. I for one would rather wear mail than robes with massive sleeves if my life depended on waving my hands about in complicated ways. They can do all of the normal things for this genre - throw around fireballs, create walls of earth, fly through the sky, etc. Spells have power proportional to their caster's skill and knowledge about magic and how to use it efficiently. This can be represented by a stat like Intelligence. Given the above, why would a wizard not be able to use magic while wearing armour? I'm looking for a sensible in-universe explanation as to why armour in general would prevent a wizard from using magic while worn. To be clear, some armour types are restrictive enough to (theoretically) cause problems - we see this IRL with things like tournament armours, but we have pictures of archers shooting in plate harness, and properly sized mail imposes virtually no restriction on freedom of movement, so a blanket ban doesn't add up. This edit might invalidate the text of some of the extant replies, but hopefully it shouldn't invalidate the concept of any of them and narrows the scope of the question enough to be reopened. If you're reading this and thinking of an answer based on metal interfering with the flow of mana, or armour being cumbersome and preventing the wizard from making the necessary gestures to cast their spell, please stop and consider whether you're adding anything that the fourteen existing answers on these themes haven't already added. Metal interferes with the correct and proper flow of mana. Depending on how far you would want to take things you can say wizards can't stand to be near any metal at all while spell casting, so no metal weapons either. Or you can just say that the wizard being surrounded by metal (as they would be while wearing metal armour) prevents them from properly controlling mana. So they can still use a sword if you wish. This could manifest itself in a number of ways, perhaps the armour gets magically charged and this causes discharges of power that are very dangerous. Or the wizard just loses control of their spells due to the interference of metal and either nothing happens or the spell goes badly wrong. Edit: I don't think the edit to the question changes this much, but the addition of the further classification of the type of magic does allow a further explanation. Metal disrupts the Weave, causing dead zones and preventing wizards from accessing it properly and casting spells correctly. Wearing armor is a skill. Just strapping armor on someone who isn't physically fit, doesn't have the callouses, muscle strength, and proper reflexes means the armor is worse than useless. It will actively impede their movement, make them fatigued, and distract them from the fine concentration necessary to cast magic. While warriors are wearing armor, getting it properly fitted, and tuning their bodies for it, magicians are studying. If a mage were to spend time practicing in armor then they would miss out on spell study. Just having armor on, with no knowledge of how to move in it, use it to block hits, or the stamina to wear it for long while running around won't lead to the "armor class improvement" seen in game systems. To address some of the comments to my answer, I believe in a RPG system, armor class is more than just passive resistance. Sure, you could drape a chainmail shirt over someone and presumably it may protect from an arrow hit (kind of like how journalists or prisoners wear ballistic armor today) but in a fight being unfamiliar with wearing armor means you won't react appropriately. Movies love to show a belly slash with a sword against someone wearing mail as being a lethal attack, but in reality that would be worse than useless as it would just dull your sword edge. A warrior would know this and not defend against a belly slash and instead strike, but a mage may not and would instinctively react to protect their belly even though they didn't need to. So this is why wearing armor may not increase your armor class without training, so why bother? Armor has to be tailored to the individual for full mobility. Mail shirts are not one size fits all. They have specific expansion areas in the shoulders to allow for the arms to swing, they are tapered in areas so they don't have excessive weight. Rigid armor sets are even worse, they need to be tightened in specific ways and are usually worn over a bulky padded underlayer. You can't just pick a set off the shelf, strap it on, and go for a jog. So a mage unfamiliar with wearing not just armor, but a specific set of armor, is gonna find that a certain set of gestures won't work while casting a spell in combat to potentially disastrous results. The risk/reward ratio is in favor of no armor. Clearly things like bulky winter clothing shouldn't interfere with spell casting (unless you really want to penalize casters) so there is a bit of handwaving. Though presumably folks in cold climates have their winter clothes and have practiced in them, modifying jackets and such to allow for proper spell casting. Maybe this is why wizards are always shown wearing robes! The least restrictive clothes to allow for the precise gestures and movements required. But unless casting spells involves yoga positions or something similar it is a little bit of a logic tweak to say that padded or leather armor will interfere with casting but a heavy woolen jacket wouldn't. So I'd say that a caster in fitted leather armor could still cast spells, but wouldn't know how to fight in leather in order to receive an AC bonus. This could apply to fitted plate armor as well. You could spend a day and a bunch of money getting it custom fit, but without years of fighting practice a wizard in plate is barely more protected than one not in plate as the weight of plate would throw off their reactions, make them easy to knock over, and they wouldn't know which vulnerable areas to protect and what areas they can use to block an attack. Add in the possibility of messing up a spell due to the armor and it becomes obvious that casters, unless they are of a specific battle mage school, should forego armor if they have any intention of casting. A wizard wearing armour is a disgrace – it suggests his magic is poor. Regardless of how good his magical defences actually are, relying on armour makes him look weak – and thus, regardless of anything else, no-one will hire him. Perhaps this even extends to undermining his own confidence, rendering his spells weak? Here is a fun folklore based reason. The bane of all fairy magic is Cold Iron. It comes up a lot in folklore and some think it might be the source of a horse-shoe for luck. It might have been the only bit of decent cold iron that a peasant might be able to get their hands on. Anyway, this root of folklore plays into a lot of modern fantasy works with iron having all sorts of effects on magic from an inconvenience to the Fey up to warping the effects of all magics. it all kind of depends. The more subtle and complex the magic is, the smaller amounts of metal you can be near without the effects becoming harder and harder to cope with. Think in terms of Radio Antenna design. For faint signals you need precise design and as my uncle the engineer (who built them) it became more of a black art than science. So your mage, when young, deals with big whomping spells and as he progresses has to be more and more aware of the metals around him. Armor would simply get in the way of the magic and become more hassle than it's worth. Besides, if you are tossing lightning about, a big metal shell is not the greatest idea. Metallic armor acts like a Faraday cage for magic. (I.e. won't allow the power to get in.) A Faraday cage prevents outside electromagnetic energies from entering the cage. In this case, the magi would be inside the chain mail metal suit, which would make a perfect Faraday cage. There are you-tube videos of people wearing chain mail suits while Tesla coils send out jillion volt lightning bolts all around them, even striking the armor. So if the process of generating the power to create the magic came from some form of electromagnetic energy (drawing lightning from the sky, for instance) the chain mail would prevent it from reaching the magi in order to be harnessed. Not all magic is incompatible with all armour. Nature magic and leather armour are fine as the druids and shaman will explain. Holy magic has no problem with full plate as any paladin will tell you. The problems are frost, fire, and necromancy. There are some obvious factors. Metal is heavy, mages tend to spend more time in the library than the gym and hence would have some considerable trouble moving around in 40lbs of armour. There are some secondary factors for frost and fire. Metal is a really good conductor of heat and often doesn't respond well to extremes of temperature. Some metals freeze and shatter, or contract excessively when cooled. Others will go soft at high temperatures and become useless as armour. The mage would certainly be more comfortable with better insulation rather than the extra weight of shattered half melted metal, and that's before even being hit by anything. Necromancers are an entirely different game from your average frost and fire mages. Necromancy just doesn't work if you don't look cool enough. It's all about those robes, gotta look good. So no answer can be "in universe" or this question should be closed as that is purely the problem of the universes creator. One mythological look at magic, particularly fairy lore poses the notion that processed iron can hurt/trap/dispel fairies. so its this corruption of an immutable natural form that gives iron (as well as any metals of your choosing)its anti-magic properties. By this explanation it justifies why mages wouldn't wear metal armor and why they tend to wear leather armor. If you were a mage you would want your fireballs to be as strong as possible. Concurrently, this also explains why metal armor is able to resist magical attacks as well as they do. Like how the heck does a knight survive a full blown lightning strike? If you don't need to worry about it for reasons of balance (which I'm going to assume is the case since you're asking here and not the RPG.stack) why not put the cart before the horse. Any wizard worth their salt doesn't bother with armor because their magical protection is inherently superior to any armor. Instead they wear what is comfortable. A new apprentice who still hasn't mastered basic protection spells might need to wear armor while learning them or practicing combat magic. This has also led to a bit of a stigma on wearing armor; If a wizard is wearing armor most other wizards (or in the know folk) will assume she hasn't mastered protection spells yet, so a prideful mage may go unarmored even when they haven't quite mastered protection spells to avoid the embarrassment of others learning of their lack of skill. Finally most opponents won't even try to stab a wizard without some sort of magical blade, due to the potentially lethal nature of common magical defenses which leads to some perfectly capable, but slightly lazy wizards not bothering to cast their magical defenses every day (security through obscurity). Casting spells is incredibly physically taxing. Every spell is, to borrow terminology from the fitness world, like trying to lift your one rep max weight while doing partial differentiation and singing the alphabet backwards in Urdu Wearing armour compounds this problem - it's a struggle to stay on your feet while casting in light clothing, and anything heavier than a tunic is just too much for most wizards (who, after all, don't tend to be the most physically fit people around). Armour is heavy. If you've ever worn a chainmail top, you'll know. Becoming a wizard requires massive study and devotion to books, resulting in wizards being physically weak because they can't devote time to training. Magical handwaving if needed – perhaps mental training for magic takes the nourishment from muscles. Thus wizards just don't have the strength to wear decent strong (and therefore heavy) armour. Wizards have various rituals that they must perform in order to fully master their spells. Wearing armor takes practice and time, it interferes with certain rituals, it's heavy when you have to carry it around and it shows that you are dangerous and prepared for a physical confrontation when all you want to do is look harmless until someone turns his back to you, which allows you to throw a ball of fire at him. Wizards just find wearing armor inconvenient. It doesn't offer anything their magic wouldn't offer and it's far too much of a hassle when thinking about what they have to do to stay as strong as they are on a mental level. Everything that needs some concentration needs to be eliminated - you don't want that Fireball to explode in your face, do you? By sticking to routines, rituals and rules your wizard stays mentally capable of casting spells throughout the day - wearing armor is something that interferes with this concentration, which is very dangerous when wielding power that is normally beyond humans. If your wizard is not careful and doesn't perform his daily rituals his magic might not work the way he wants it to work in a critical moment, leading to his death. And death is not a good thing for most wizards - at least if they are the ones who die. You need to provide an incentive to not wearing armor by making it affect the areas where your wizards are especially good. If you need different types of mages where some are capable of using armor and others are not you could vary the kind of rituals. A war mage might in fact need to spend at least 4 hours every day in full plate armor. It's what he always does, it's what feels natural. It helps him concentrate and brings him into a mental state where he is able to quickly react to any danger. When he takes off the armor he suddenly feels all the tiredness of the day and becomes far less capable of using his magic. But war mages are not wizards - that's why war mages need to wear armor, while wizards can't wear armor if each one wants to be capable of using his magic. Metal based armors absorb magical energy, as they conduct energy efficiently in any form. Due to this, metal armor causes the energy to course over it, losing focus and potency in the circuit of the armor and caster until it loses almost all power. The chance of being able to cast through this is low. Weight can also cause concentration issues. Hides and leather, however, are the remains of dead animals. This taints the magic, causing it to either carry traces of necromantic energies, or the energy of the creature itself. In some very specific cases, armor like this could be beneficial, but only if it is a rare creature of magical energy, and only if the caster only wants to cast one type of spell (that associated with the creature's energy). The armor still causes the spell to lose power, and thus have a chance of not working, but is also tainted by the energy of the creature the skin came from. Natural Fibers that are not mixed fabrics allow the caster to have the least interference in their casting, thus allowing them to channel properly. Magical energy passes much more easily through cloth than through animal remains or metal, and that energy isn't altered. This allows easy casting that follows the intent of the caster. Focusing power through objects such as wands is deliberate. The wand is typically made out of conductors made of animal remains or metal because then the downsides of armor can be focused as positives, by conducting the power to a singular point of focus. They can still flavor the magical energies, but when deliberate and focus-able, it allows more control over the shift in energy. This answer is inspired by a line in Dan W's answer. In short: It is all about confidence. Magic is supernatural. Yes, in this universe the magical energy is part of the world, but fireballs don't just spontaneously erupt from the sky. Using the energy allows you to break the normal physical rules of the universe, it allows you to change causality. Breaking the normal physical rules requires not just that you say the right words, and perform the correct gestures, but that you actually believe that the ritual will have the intended result, and that you personally can control causality. It requires suspension of disbelief. Any doubt weakens or completely undermines the casting. A skeptic performing the ritual with technical perfection but not believing it will do anything will produce no results. Armour is a tool to mitigate risk of harm. Wearing armour is an implicit acknowledgement of that risk, thus on a subconscious level undermines the belief that you are in control. If you were confident you were in control, then you are not at risk and wouldn't need protection. Wearing simple robes is acceptable because that isn't about protection or control, it is about modesty and keeping up cultural norms. Culturally people are taught from a young age that wearing armour is incompatible with casting spells, it has become part of the zeitgeist, it is accepted lore. As such it is an integral component of the wizard's belief system. They believe wearing armour will undermine their ability and so it does. Note that since this explanation is entirely mental, it allows for exceptions! "This was my mother's, I wear it out of sentiment." "This stuff is heavy, wearing it at all times helps keep me at peak physical condition." One could become deranged and actually believe that armour and magic are still incompatible for normal people, but I'm special. They then go on wearing the armour as proof of their special status. If you can create walls of earth, do you need armour? Incoming arrow? Block it with a wall of earth. Incoming fireball? Wall of earth. Incoming sword? Maybe a smaller, well-placed pillar of earth to knock the guy's sword arm out of the way. Alternately, maybe a "Shield" spell exists, that creates a protective sphere around the caster. It would take mana to maintain, and more while it's under attack, but it would protect the caster from any and all attacks (and could be one-way so they can fire attacks out of it). A wizard who can cast a Shield spell or Wall of Earth spell might not think armour is necessary, regardless of whether it would reduce their magic ability or not. Arcane magic involves drawing energy into your body from the world around you. Wearing something as solid as metal armor is to magic what wearing something over your nose and mouth are to breathing. You can deal with having your nose blocked if your mouth is free - so rings and pendants and the like aren't a major problem - but if you have your mouth blocked and need to pant, you're going to have a bad time, and so too if you're wearing a breastplate. Maybe some people can train themselves to work under those conditions, maybe no one can. Maybe some special material - like what we use for a surgeon's mask in our analogy - can be created to enable you to draw energy in...but maybe no such material exists that's both protective and allows that. Or maybe a spellsword can just learn how to draw energy differently, like a person can learn to breathe circularly or something. There are all kinds of different degrees that you could take here, too. Maybe even a ring or pendant is a little problem, if it's not specially enchanted to not obstruct the flow of magic. Maybe that same enchantment could be applied to armor if you could get someone capable of casting the spell that much despite an inverse economy of scale - or maybe that's not possible at all. And if you want these same principles applied to other types of armor, it may be that it's not the presence of metal but the presence of any kind of thoroughly-air-obstructive or insulating material. Maybe wizards DON'T wear thick robes in this world, or those thick robes are pushed aside by wind produced by drawing energy in, in a way that leather or metal armors aren't. In fact, maybe robes provide a sort of 'wind tunnel' effect to amplify the caster's ability to draw magic in! This mechanism also adds a neat approach to the lore behind retaining spells. Maybe the spells that you 'memorize' are actually just precast, and their energy rests against your body until you summon them forth. You can recognize a high-level wizard because there seems to be a slight wind going through his robes at all times, and you see a magical spark-light effect if he holds a shield for too long as the energies struggle to escape him and are aided by the shield's interference. No mage is perfect. No spell is perfectly controlled - which means that every time they throw a spell around, the mage is also releasing chaotic secondary effects out into the immediate space around them. Those effects are really rough on things like heavy armor, often reducing it to an unusable state after only a day or two of a standard adventurer's workload of spellcasting. Higher-powered mages can afford this better, but they also throw around more powerful spells, which means it tends to happen (much) faster. Thankfully, mages have figured out a few relatively straightforward enchantments for making robes self-repairing, but no such enchantments have been discovered for the heavier armors. Also, if a fight happens, you might want to give the wizard some room. Just saying. Basically, while they technically could wear armor, it's not worth it for the sheer cost of keeping the stuff repaired... and that means that it's not worthwhile for the mages to learn to wear the armor properly in the first place. Also, while the mage is protected from the direct effects of his spell's spillover, he isn't protected from the spillover. Independently wealthy mages have worm plate in the past. Independently wealthy mages have also died a time or two in the past when their armor got warped by spacial magic into a cage of inward-pointing spikes. The necessary gestures are precluded by protection. In some worlds, armor interferes with all magic, hence the answers talking about Faraday cages and magical charge. In earlier editions of D&D, armor specifically interfered with somatic components, the gesture part of a spell, but not with purely verbal spells. Additionally, not all armors are metal, and hide armor can still can interfere with spells. Given this, I like the idea that the act of protecting yourself is what interferes with magic. How does this work? The more armor you wear, the more likely that a given body part you might need to "open" up to the ether via gesture to draw power is covered and less likely to get you into the proper position to complete a spell. For example, perhaps your spell gestures require you to place your hand on a central chakra/chi node/magical organ, simply, you gotta touch your chest. Wearing armor means you can't effectively complete this gesture, and even some thick leather might occasionally catch you up in the complex act of tapping into arcane energies. This is, of course, done for reasons of balance ... I'm looking for a sensible in-universe explanation. Note that in fantasy settings there frequently are beings with powers beyond that of the gods. They may be called "Eru", "Ao" or "Dungeon Master"; in any case they are beyond caring for the worship of mortals, and care mainly for maintaining a form of balance. This balance allows for at least limited free will. It is in their interest to ensure that the the universe is not dominated forever by a single wizard with mind control and necromancy powers. Thus they shape the arcane powers to give wizards at least one Achilles heel, so there is always hope that such a tyrant would be overthrown. Although wizards draw on the arcane power created by the overdeity, they have no need to pray. Indeed they only depend on the overdeity for arcane power in the same way a fighter depends on the overdeity for the existence of iron (or food and water). Never-the-less the rules of reality that so limit wizards were created by an overdeity with an explicit interest in balance. There's nothing forbidding a caster to wear heavy armor... unless they want to boil inside the breastplate. That's because channeling mana through our bodies is quite an exotermic reaction and it's easier to bear if you're wearing light-fluffy wavy clothes. Maybe you think that the heat could be bearable but ask yourself: would you be able to concentrate on complex chants inside a furnace at 40-50 degrees? Depending on your setting there might simply be some analogy to the Geneva Conventions in place prohibiting mages from wearing armor at all. This could be because of some concept of honor or fair-fight philosophy. Regents/Generals may have had a problem in the past with troop morale. Foot-soldiers may have rebelled because they felt they were merely cannon-fodder and human shields for the mages. Putting these rules in place may have solved that problem. A historical example of such deliberate restrictions can be found in medieval times. 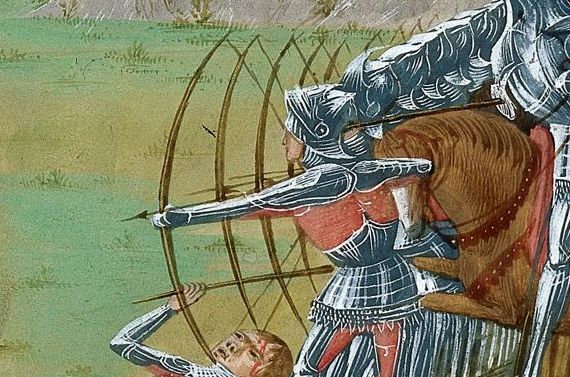 The use of crossbows against christian soldiers was generally frowned upon or even forbidden. If magical energy was being transferred from one point to another, it's reasonable that it might move in waves (in analogy to sound waves and light waves). If that's the case, then the magic wave speed (more specifically, the wave impedance) would depend on the medium the waves were traveling in. If the wave speed changed in certain ways because of a change in the medium, then there could be both reflection and refraction. Armor, then, might not only reflect magical energies, but set up standing waves of magical energy within that armor (and so within the magic user) that would be less than healthy to that user. The armor might refract the magical energy too, into directions that are difficult to control. This could also be why the magic user uses a wooden staff. If the staff had a magical wave speed that was in-between the wave speed of the user's body and the air, then there would be less reflection at the boundary between the magic user and the air and so there would be less energy lost in casting the spell. Heavy garments block the flow of energies around the body. Harnessing those energies is what makes magic... well... magic. Movement: You need precise control of mind, spirit and... body. Heavy clothing interferes with those precise movements. It takes pure materials and "good" energy to make proper clothing for a mage (in addition to heavy materials being bad and impure materials actually blocking magic)... that's why silk is better than wool... and why druids are known to dance naked under the full moon. Wizards do not normally engage in hand-to-hand combat. Their primary offence is magic and, while they might use weaponry, they are probably best advised to run away because they will be facing those much better trained and, in any case, a good (or even mediocre) wizard is far more valuable than an ordinary soldier. Although a wizard may use magic defensively, they are most effective when concentrating their magic for attack purposes. Their best defence for most practical purposes is to hide behind something like a wall or in a good solid tower. Light armour may help, if necessary, to protect a wizard out in the open from ranged weapons but may be counter-productive if it significantly slows him in running for cover or prevents him from crouching behind whatever may give protective shelter. Wizards are essentially cowards - they don't dress to fight, they dress to run (and otherwise just to look good). Interesting that you would even provide the link to the Weave and you haven't gotten a Weave based answer. Spell casting is less about 'casting a spell' and more about entering the non-physical world that this world is drawn upon and asking the very fabric of existence to rearrange itself to suit your needs. You need to unbind yourself from this world to see and interact with the Weave for spell casting to become reality. Of course clerical magic gets around this as the clerics very core is bound to their God and can access the weave through their binding to their God and not need to enter the weave themselves (they ask the god of this world to alter the weave for them, while a spell caster must enter the weave and ask themselves). From my 7 year old son - in all universes, all magic comes down to manipulating energy through some system such as psionics, ritual, familiar spirits, link to nanotechnology left over from a prior civilization, divine (or not) grant, etc. Metals are good conductors of energy (electricity, heat, sound, etc). Metal armor interferes with the mage's ability to control the energy they are manipulating by shorting it out. However, properly formed metal tools and implements can actually aid in the manipulation of energy (ever seen a radar dish? ), so the same should be true of magic. (Edit) I suddenly get an image of a mage with a parabolic metallic reflector cowl behind his head. If I remember correctly, even in the Forgotten Realms there was a God of magic, whose clerics might not be magic users, but who was considered the creator and administrator of what magic was. It could be as simple as a dictate from the deity. Another possibility comes from mixing in some other themes of magic. It could be the souls of those capable of wielding magic are vulnerable to influence from spirits (ex: the main villain of the first book of the Inheritance series, Eragon, was overwhelmed by spirits). Could be, every magic sensitive in the realm is provided abjuration protecting against spiritual assault. Armor is a strong natural abjuration from physical assault. The natural physical abjuration might weaken the spiritual one, like a drug interaction, leaving the magician vulnerable to having his or her mind consumed. This would tap into Hermetic ideas of contagion. Or, it might be that the (pure) unbound body, robes of rank, and other accoutrements are a usually-not-talked-about somatic and material component to most (if not all) magic. This would pull in ideas from Egyptian and Oriental magic where, to make something happen, you had to demonstrate (somehow) your authority to be making requests. Or, magic might be a widely encountered force, and it might be mediated by tiny elementals and tiny spirits. This pulling in ideas from modern physics where particles communicate light (photons), gravity (gluons), and mass (higgs). Could be a scary armor scares away, or a strong natural abjuration drives away the spirits of most utility to the average magic practitioner. This could also help explain magic poor areas (if they exist in your world). But this approach is a supernatural restatement of the "metal short circuits/Faraday cages magic electricity" suggestion. Quite related to the mana-based approach on interference between magic and metal. However, I noticed we can also use this argument to exclude ordinary cloth. To do that, we could simply say that wizard robes are woven of a special material, say, unicorn hair. And we could further say that unicorn hair is not just the only material that allows you to wear it and still channel mana, but rather actually a necessary conduit of mana in first place. While there might be metals with the same capacity to conduct mana, you could easily restrict that property to the most special, but also most clumsy metals, like gold or also electrum, a melding of gold and platinum present in many fantasy universes. Believe me, even if you go for mail, goldmail and electrummail are already quite heavy. Mithril is often used as a metal that's very lightweight and incredibly sturdy, and certainly you'd have a hard time to justify it cannot conduct mana since it's one of the most unique materials in existance, but it's also incredibly rare. In most fantasy stories where mithril is present, only the most skilled dwarven metallurgists are able to produce it, let aside the fact that the needed metals are among the rarest as well. And as a matter of fact, you don't even need to include mithril in your universe (although most people would probably be a little bummed if you didn't). Staves are not made from metal, because it stops the energy from flowing (electricity -> ground), while formerly alive materials such as wood or bones are used to flows of magical energy. Mail armour mesh could stop the flow of energy from the caster, just like a cage does for electrical discharge. With added size and weight, there is a chance, that the spell will discharge into the caster and not the intended target. Many magic systems require some sort of sense, to cast the spell successfully. (The caster has to see the target-offensive spells, the target has to hear the caster-controlling curses, sound from caster must spread-thunder voice, etc.) So the caster can not wear a helmet, but instead wears a big hat, to prevent from being blinded by sun. Because of elemental nature of some spells (lightning, frost) some spells could also target the caster, if he wears metal objects. In my world I compensate for this with using rare highly conductive materials (mana crystals, gold, silver) or using enchantments and runes, to artificially infuse the material with magic and thus making it conductive. Thinking about mana/magic as if it was electricity and/or radiation/light, helps you establish basic rules. And make reasonable and strongly set rules. If we try to apply game rules to the in game universe logic wizard spell casting is primarily a mental exercise as indicated by dexterity not being of no relevance as could be expected if intricate and complex set of movements is required. In addition not all spells in the wizards list have somatic components I.E don't require movement and in fact some bards can ignore the adverse effects of armor presumably because their spells are "simpler". Taking that into account it is reasonable to assume that the problem with armor among wizards lies in effect wearing it has on the mind of the wizard or in other words a wizard can only cast spells when he can convince him self he can and since in FR setting arcane magic of the wizards relies on vast and old traditions maybe wizards struggle with armor because their whole concept of "wizardness" is constructed that way. In a world with magic, everyone uses magic. Now, they don't memorize spells and wear robes. But every blacksmith uses magic to forge metal, every leatherworker uses magic to cure leather. Midwives use magic to birth babies, matchmakers use magic to find matches. Magic is everywhere, so everyone uses it. Every kind of effective armor must be enchanted, because unenchanted armor is garbage. The other side has enchanted swords, and they will cut through your unenchanted armor like butter. Even human bodies are enchanted. From the little things, protective magic placed on them by midwives, mothers, fathers. Ancestral blessings placed on them through prayer wheels. Wizards are people who collect magical secrets in the form of spells. In order to cast these spells, any enchanted items you have on you have to be taken into account. The magic that infuses weapons and armor doesn't work well with most wizard magic. Their presence on the body warps the spells. The "armor" that a wizard must wear is enchanted with effects that help them cast their spells, and the "weapons" (staffs, wands, orbs) likewise. These enchanted tools and clothing don't protect you against swords, at least not passively. Instead, they enhance and enable you to cast spells. If you could find a armorer willing and able to make it, a wizard could wear unenchanted plate armor just fine. Wouldn't do him much good against anything other than hail stones, as any crude dagger used by an urchin with even a modest enchantment makes your plate armor useless. This also permits there to be "wizards" who do use armor and weapons. They either use a different form of magic/spells, and/or they have unique enchantments on their armor/weapons that permit both weapon use and magic use. Such "spellswords" may not be able to cast as powerful a spell given the same level of training as a traditional wizard. Why would magic users dress differently from everyone else?